Thanks to everyone that turned out for the Annual General Meeting and Registration on Wednesday September 5, 2018. Our second in-person registration night is Thursday September 6, 2018, at Bishop Filevich School on 105th St from 6:30-7:30 pm. On-line soccer registration is now open until September 8, 2018. Late registration available for additional $50.00 fee and only if there is available space on a team. Goalline accepts only online payments such as PayPal, debit and credit cards. A community association membership is required to register. 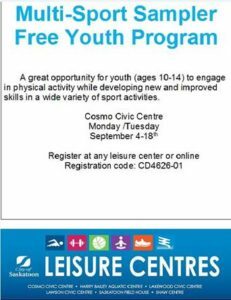 Please email Arifur Rahman or call Arifur at 306-381-0406 with any registration questions. In person registration will be available on our upcoming registration nights, to be announced. All Kinder and U5 teams are co-ed. Kinder Soccer is administered by SFG Community Association, U5 and up administered by Saskatoon Youth Soccer. U9 Development & U11 thru U19 Girls and Boys is administered by Hollandia Soccer Club – Registration dates and places are available online at www.hollandiasoccer.com. Questions about U9 Development and U11 and up may be directed to the Hollandia Coordinator, Darcy Overland. Queen Seraphina and the Land of Vertebraat is an epic tale about a time and a place where everyone was disabled. A land of golden ramps and quiet spaces that was ruled by kindness alone, until a mysterious stranger arrives… This original story was written by Adam Pottle and adapted by the Sum Theatre ensemble. 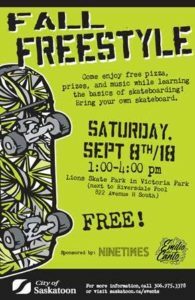 Presented by the Saskatchewan Human Rights Commission and Concentus Citizenship Education, join us for the free, family friendly show in Saskatoon public parks July 2 – 31st. July 17, 2018 in Les Kerr Park at 7:00 pm. Bring picnic blankets, lan chairs and fishing gear. 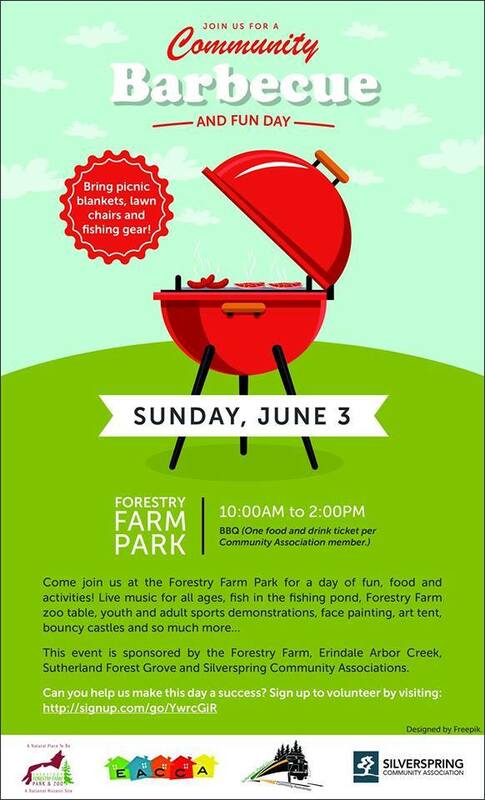 This event is sponsored by the Forestry Farm, Erindale Arbor Creek, Sutherland Forest Grove and Silverspring Community Associations. The Community Association needs your help to run this successfully. Volunteer spots are for an hour. Please take a moment and sign up where you can! On-line outdoor mini soccer registration is now open until March 2, 2018. Sutherland Forest Grove outdoor mini soccer runs from May 1, 2018 to June 30, 2018. Late registration may be available for additional $20.00 fee and only if there is available space on a team. Goalline accepts only online payments such as PayPal, debit and credit cards. A $35 uniform deposit cheque is required for all players (except U4 Kindersoccer) which must be given to the coach before players get their shorts and jersey. Please post-date cheques for July 30, 2018, made payable to Sutherland Forest Grove Community Association. In person registration will be Wednesday February 15, 2018 from 6:30 pm to 8:00 pm at Forest Grove School. Cash or cheque only. Kinder Soccer – Fees $60 (Born 2014/2015) Possible game days: Mon. – Fri. The Saskatoon Fire Department strives to provide a four-minute traveling response time to all areas in the City of Saskatoon. Geographic modelling shows this level of service and safety will be possible to Sutherland and University area neighbourhoods when Fire Station No. 5 is relocated from 105 Street and Central Avenue to closer to the intersection of Preston Avenue and College Drive. 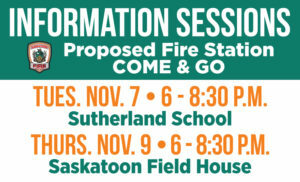 SFD will be hosting two public information sessions, for you and your residents to attend and learn more about this project. More information, including frequently asked questions and the history of Fire Station No. 5, will be available at www.saskatoon.ca/NewServiceModel. If unable to attend, please send information requests to: [email protected].